Alerts provide a way for Ensemble to automatically notify users about a serious problem or condition that requires a quick resolution to ensure that the production continues operating normally. When properly configured Ensemble generates alerts for potentially serious problems and should not generate any alerts caused by normal variations in the production performance. In configuring any alert notification system, it is important to calibrate the level that triggers the alert and ensure that the users being notified understand the alert and know how to respond. If the trigger level is set too high, problems may already have a significant impact on performance before Ensemble notifies users. But, if the trigger level is set too low, Ensemble sends out many notifications during the normal operation of the production and users tend to ignore these notifications and may not respond to the few critical ones among them. Alerts are messages of type Ens.AlertRequest that can be generated by any business service, process, or operation in a production. 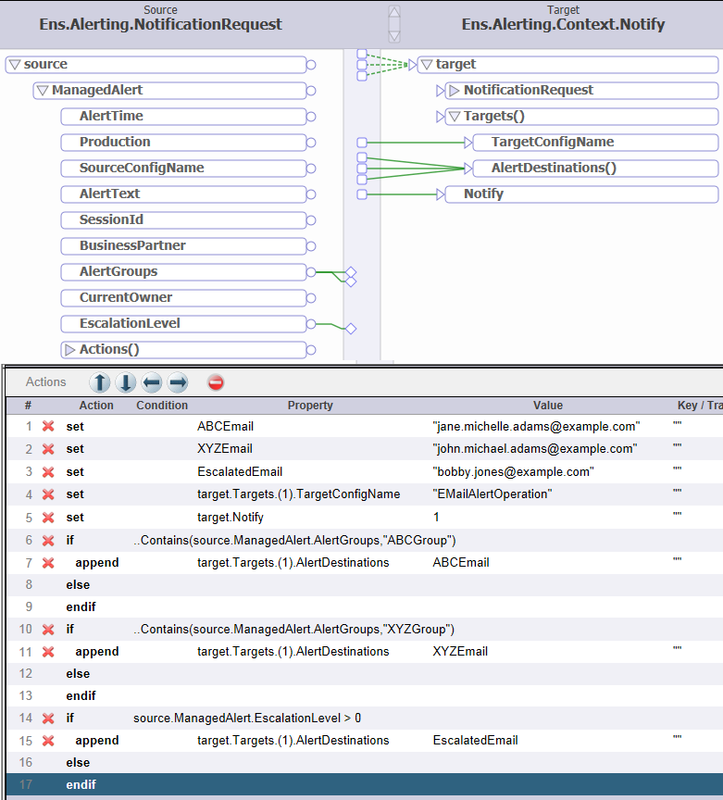 Ensemble always stores alerts messages in the log. If there is a production component named Ens.Alert, Ensemble sends all alert messages to it. Ens.Alert typically is an operation, such as EnsLib.Email.AlertOperation, a routing process, or the Alert Manager, which has the class Ens.Alerting.AlertManager. If you don’t want automatic notification, you are done. Your production should not have a component named Ens.Alert. Ensemble will write alerts to the log file but will not do anything else with them. If you want to send all alerts to a single list of users by the same mechanism but do not want to track and manage alerts, add an operation with a class such as EnsLib.Email.AlertOperation and name the component Ens.Alert. Ensemble sends all alerts to the operation and it notifies the configured users. See Configuring Simple Notifications. Specifies the number of items on a queue. When the queue size reaches this number Ensemble generates an alert. Setting this to a value such as 10 causes an alert when a queue starts to build on a critical item indicating some delay. But some queues may get this large during normal operation and if a component receives a nightly batch of work, setting this parameter may cause unnecessary alerts. In routers that provide validation, such as the HL7 router, this setting specifies that any message that fails the specified validation generates an alert. This alert is in addition to sending the original message to the bad message handler. Specifies the number of seconds to retry sending a message before failing and considering it an error. Setting this property to 1 instructs Ensemble to continue to retry sending the message indefinitely and to not fail. Typically, this is the setting to use for critical messages that must be processed in FIFO order, such as HL7 messages. If Failure Timeout is set to a positive integer, the operation fails after this number of seconds, discards the current message and attempts to process the next message. This setting for HL7 determines how the operation responds when the target application returns an error reply code. This is a critical setting that determines the operation behavior for a failure. The values are fairly complex but hover text help is available by clicking on the ‘Replycode Action’ label in config settings tab. Typically an operation should retry indefinitely if there is an error sending the message. To ensure indefinite retries after all NACKs set FailureTimeout to -1 and ReplyCodeAction to :?R=RF and :?E=RF. If the target application rejects the message (AR) retrying will probably have the same results so you might want to do something different. However applications can’t always be relied on to use the ACK codes correctly and each application should be considered individually. One option is to disable the business operation after a rejected message but that stops all traffic. Suspending rejected messages until the problem can be fixed will allow other messages to flow but will break the FIFO ordering. Credentialsspecifies the Ensemble credentials that provide access to the SMTP server. If UseDetailedSettings is not checked, the email message contains only the alert text and the email subject is Ensemble Alert from configuration item Ensemble-Instance-Name:component-name, The default is to not check this setting for compatibility with previous versions. SystemName if UseDetailedSettings is checked, this setting specifies text to be used in place of the Ensemble-Instance-Name. The EnsLib.MsgRouter.RoutingEngine class provides the setting Business Rule Name. If you specify this setting as the name of a routing rule set, this business host uses the logic in that rule set to forward all the messages that it receives. To use the routing rule to specify the addresses to send the alert, you can add a transformation that sets the AlertDestination property of the Ens.AlertRequest class. For an example, see the Demo.HL7.MsgRouter.Production in the ENSDEMO namespace. In this example, the routing rule sends all alerts to the email operation and uses a transform with a lookup to specify the alert destinations based on the component that created the alert. The addresses specified in the AlertDestination property are added to any addresses specified in the Recipients setting. Alert management provides alert routing capability plus the tools needed to track and resolve alerts. Alert management allows you to assign an alert to a specific user, track whether the alert has been resolved or escalated, and report the time that it took to resolve the alert. Alert management can be added to a production using the Ensemble management portal including the rule and transformation editors without writing custom code. For specialized requirements, it is possible to add custom code in the alert management production components. 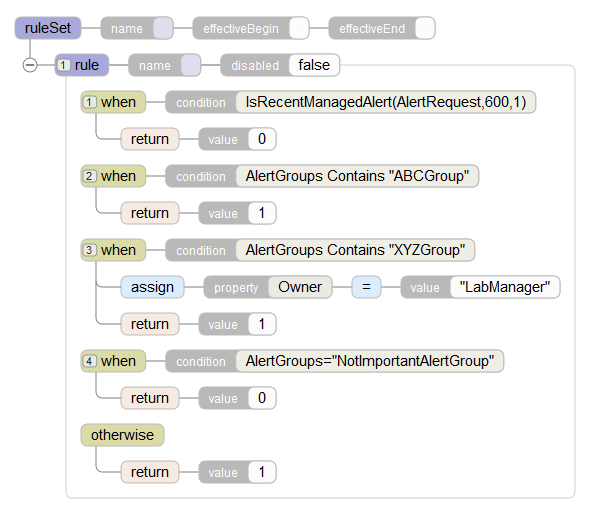 See Adding Custom Code to Alert Management for more information. Managed Alerts page. To reach this page, select Ensemble > Monitor > My Managed Alerts. Managed Alert Viewer page. To reach this page, select Ensemble > View > Managed Alerts. Display-only access to managed alerts. Can search for alerts based on owner, open status, time, escalation level, source, and alert group. CredentialsYou have to create credentials using the Credentials page to specify a username and password that can use the SMTP server to send email. To access this page, select Ensemble > Configure > Credentials. Then specify the credentials in this field. SubjectPrefaceSpecify text that is prefixed to the beginning of subject lines on the alert email message. By default the subject line is Ensemble ManagedAlert from configuration item 'ComponentName’ on system 'EnsembleProcessName'. IncludeUTCTimes checkboxif checked, the email message includes the UTC time as well as the local time. After you have received an email or other message indicating that there is a managed alert that requires your action, you can view the open managed alerts that are assigned to you or that are unassigned by selecting Ensemble, Monitor, and My Managed Alerts. The Managed Alert Viewer allows you to search and view all managed alerts that are stored in the database, including closed alerts and alerts assigned to other users, but you cannot update alerts from the Managed Alert Viewer. 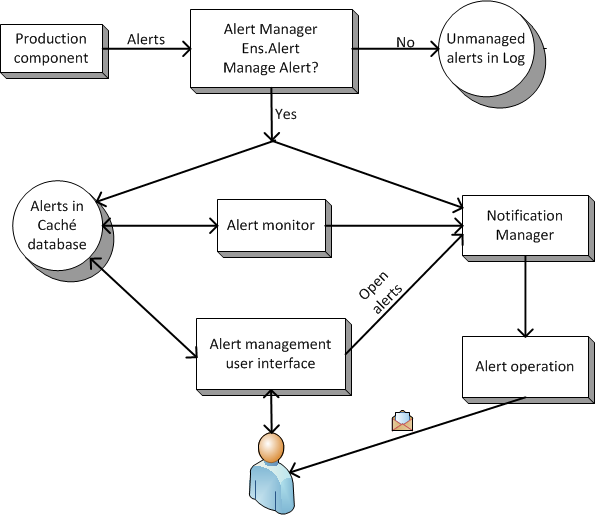 To access the Managed Alert Viewer, select Ensemble, View, and Managed Alerts. Auto-Refreshspecifies whether Ensemble should refresh the list at the selected interval. Sort Orderspecifies whether Ensemble sorts the list based on the initial alert time or the escalation level. Time Formatspecifies whether Ensemble displays the full date and time or just the time. Open Statespecifies whether Ensemble searches for only open alerts, only closed alerts, or all alerts. Ownerspecifies whether Ensemble searches for only alerts owned by the current user, only unassigned alerts, or all alerts. There is no sample in ENSDEMO that demonstrates alert management. 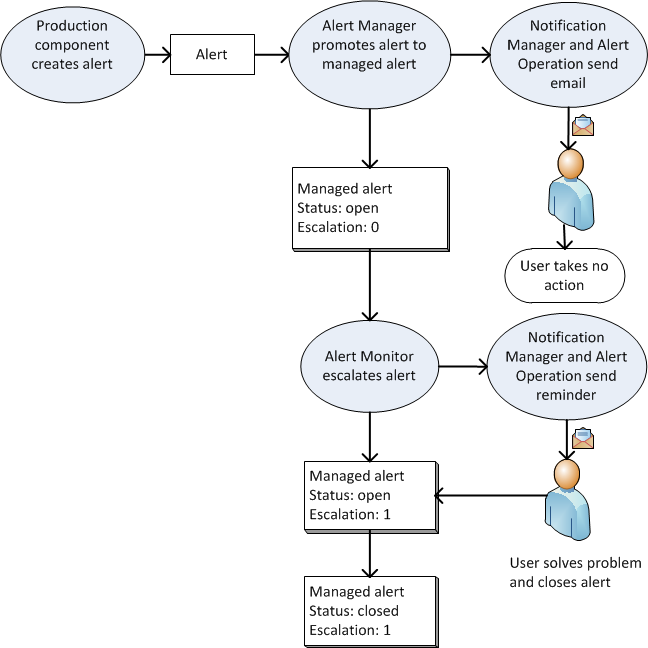 You can start with any of the example productions and follow the instructions in this section to demonstrate alert management. As an example, this walkthrough starts with the Demo.HL7.MsgRouter.Production production. This starting point uses a routing alert processor, but you can follow the same steps with a production that does not have any alert code. In order to complete this walkthrough you must have access to an SMTP server to send email. Because this is a walkthrough of a complex feature, it covers the important steps in the procedure but does not explicitly describe every user action. For example, it assumes that the readers know that they must enable each component in the production and respond to dialog windows. Credentialsyou have to create credentials using the Ensemble > Configure > Credentials page to specify a username and password that can use the SMTP server to send email. Recipient, Cc, and From fieldsspecify valid email addresses. AlertTable data lookup tablespecify valid email addresses. You will be modifying this production. If you want to retain the original sample, you should export the production and then import it into another namespace. To export a production, select Production Settings, Actions tab, and Export button. To import a production, select System Explorer, Classes, and the Import button. If you want to preserve your work you should not work in the ENSDEMO namespace, as it is cleared when you upgrade Ensemble with a new or maintenance release. Select the Ens.Alert routing business process. Delete it by clicking Delete on the Actions tab. You will be adding an Alert Manager and naming it Ens.Alert in the next step. You can skip deleting the EMailAlertOperation since you would be adding the same component in the next step. Define credentials in Ensemble with the username and password to access the SMTP server. To get to the Credentials page, select Ensemble > Configure > Credentials, then specify an ID to identify the credentials, a username and a password. Define a user to handle alerts. You can use a user that you’ve already created on your system or define a new user. To define a new user, select System Administration, Security, and Users. Then click the Create New User button. In the walkthrough, we are using the username LabManager, but you can use any name. Give the user the following roles: %EnsRole_AlertAdministrator or %EnsRole_AlertOperator. The %EnsRole_AlertAdministrator role allows a user to update any alert, including an alert that is assigned to another user. The %EnsRole_AlertOperator role allows a user to update any alert assigned to that user and to update unassigned alerts. All component names in this walkthrough are arbitrary except Ens.Alert, which is a required name. Alert Notification ManagerEnter the name that you specified for the Notification Manager. For this walkthrough it is NotifyMan. Alert Notification OperationEnter the name you specified for the email alert operation. In this walkthrough it is EMailAlertOperation. Alert Action WindowEnter a number of minutes. This is the default number of minutes that a user has to resolve and close an alert before the next reminder message is sent. For this walkthrough, you can leave this setting at the default 60 minutes. For this and the other settings in this walkthrough, click Apply. Modify the ABC_HL7FileService File Path to specify an nonexistent directory and click Apply. The component should turn red. Select Ensemble, Monitor, and My Managed Alerts. The two managed alerts should be displayed after you select the Unassigned and Today tabs. Select an alert. You can now update by reassigning the alert to yourself or another user, by making the next action time earlier or later, by escalating the alert, or by closing the alert. Once you have updated a field, you must enter a reason before you click the Update button. You can also go to the Managed Alert Viewer by selecting Ensemble, View, and Managed Alerts. This page allows you to query for alerts including alerts that are closed. Select Ensemble, List, and Business Rules. Enter the package name for the production. In this walkthrough, enter Demo.HL7.MsgRouter. Name the rule. For this walkthrough, name it AlertManCreationRule. Use the rule editor to enter the following rule. Replace LabManager with a Caché username on your system. In the production configuration page, select Ens.Alert and set the CreateManagedAlertRule property to Demo.HL7.MsgRouter.AlertManCreationRule. 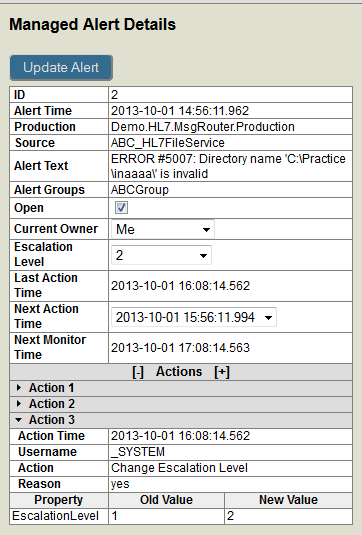 Alerts in the NotImportantAlertGroup do not create a managed alert and are only written to the log. To test this, create an error in the Extra_Observations operation, which is in this alert group. To do this, change the operation’s File Path to a nonexistent folder and place a file whose name starts with ABC and that contains an ORU_R01 message in the ABC_HL7FileService input folder, C:\Practice\in. This should create an alert that is written to the log file but that does not create a managed alert. Select Ensemble, List, and Data Transformations . Name the data transformation. For this walkthrough, name it NotifyManTransform. On the production configuration page, select NotifyMan and set the NotificationTransform to the transformation Demo.HL7.MsgRouter.NotifyManTransform. Name the rule. For this walkthrough, name it AlertMonitorRule. In the production configuration page, select AlertMon and set the OverdueAlertRule property to Demo.HL7.MsgRouter.AlertMonitorRule.